Dylan Atkins, Lori Jockers, Kayla Marchant, Ariel Pignatelli, Jack Yang and Christian Zoeger will become the first SUNY New Paltz students to complete the College’s Bachelor of Science in Mechanical Engineering degree program when they graduate with the Class of 2017. 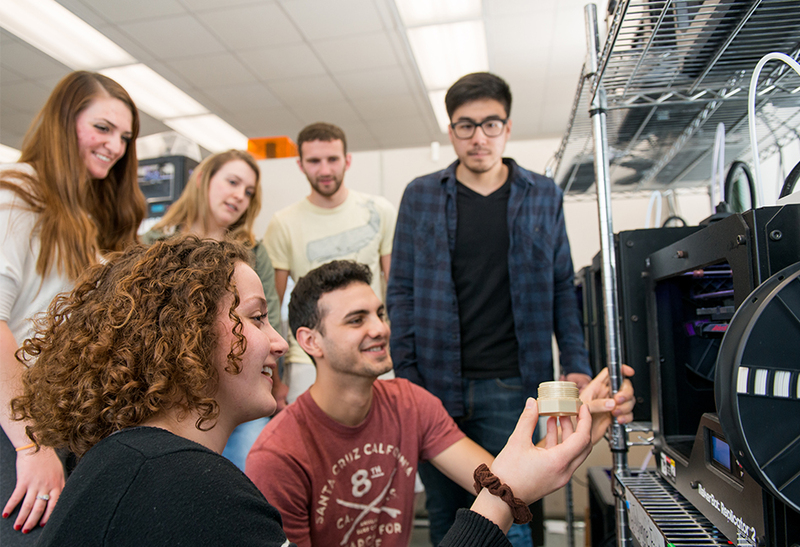 The undergraduate mechanical engineering program at New Paltz launched in 2014, and complements the School of Science & Engineering’s long-standing, ABET-accredited programs in computer and electrical engineering. The six students who will complete the program this May were among the first to declare the new degree. The program is defined by its small class sizes and close student-faculty collaboration. 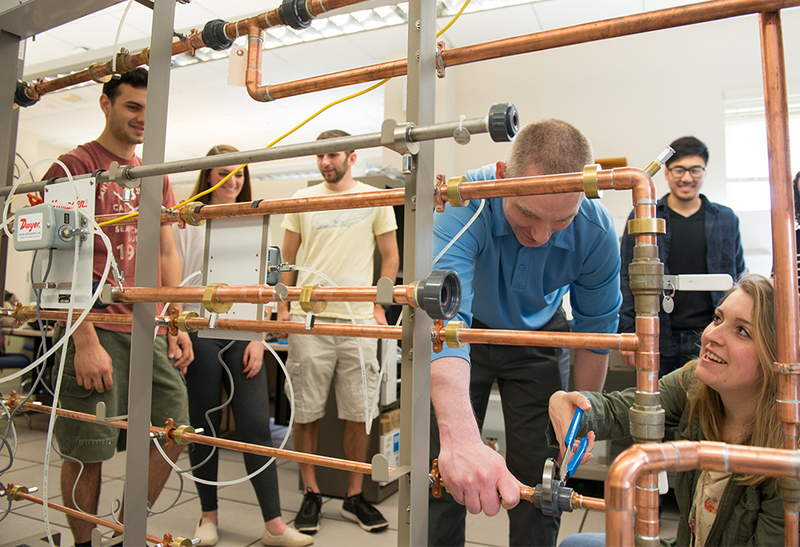 Courses focus on preparing students to meet the modern demands of employers, particularly those in the Hudson Valley and across New York State whose need for skilled engineers was a driving force behind the creation of the mechanical engineering program at the College. 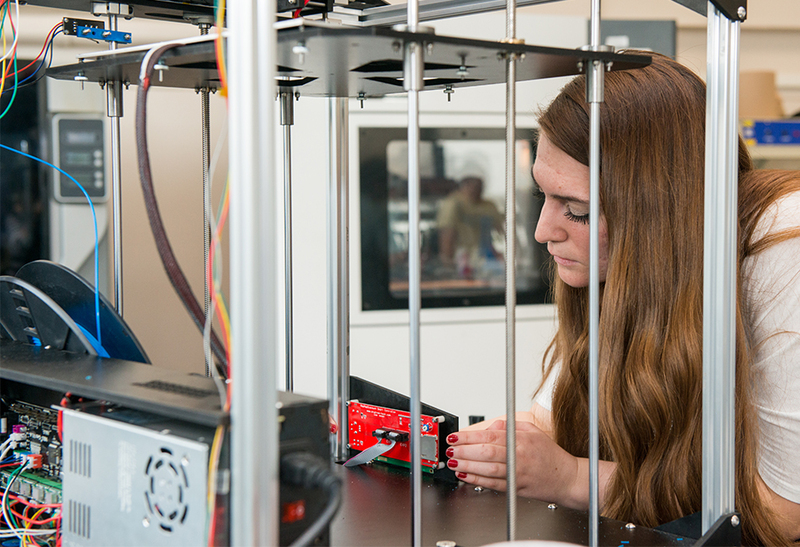 Students and faculty have access to state-of-the-art facilities, tools and technologies, including the Keysight Technologies Senior Design Lab in Wooster Hall, which houses best-in-industry test instruments provided by the international leader in engineering hardware. The program has grown rapidly, hitting the 100 enrolled student milestone in fall 2016, just two years after its debut. Of the 109 New Paltz students enrolled in mechanical engineering during the spring 2017 semester, 28 (or 26 percent) are female, and 81 (74 percent) are male. A 2016 National Science Board report, with data current up to the year 2013, recorded that nationwide women’s enrollment in engineering fields was at 19.3 percent, indicating that the participation rate of women in mechanical engineering at SUNY New Paltz is higher than the national average. “I transferred here from Dutchess, and wasn’t sure at first whether the mechanical engineering program would be able to take me, because it was so new. But it was a smooth transition, and I’m happy I transferred here,” said Kayla Marchant of Rhinebeck, N.Y.
With continued growth forecasted for this and other engineering programs, New Paltz students and faculty are looking forward to the construction of the new Engineering Innovation Hub, which is expected to open its doors in late 2019 or early 2020. Visit the Division of Engineering Programs online to learn more.